Wonderful getaway! An enchanted seaside classic with expansive views straight down secluded Crocket Cove. Sun filled, sedate, romantic and beautifully appointed. Astounding views of the cove and the huge rolling wild flower filled central meadow of Cove Meadow. Owner Managed with an eye to detail, and a view to your comfort and enjoyment of all that is here to experience. . Sited on 10 magical acres of mostly open meadow surrounded by stands of ancient trees and moss carpeted forest with one third mile of private shore, the cottage has its own exclusive two acres and 300 feet of shorefront. Own Organic kitchen garden and own exclusive firepit. Shared use with other cottage of two kayaks and one canoe. On site launch for your small boat. 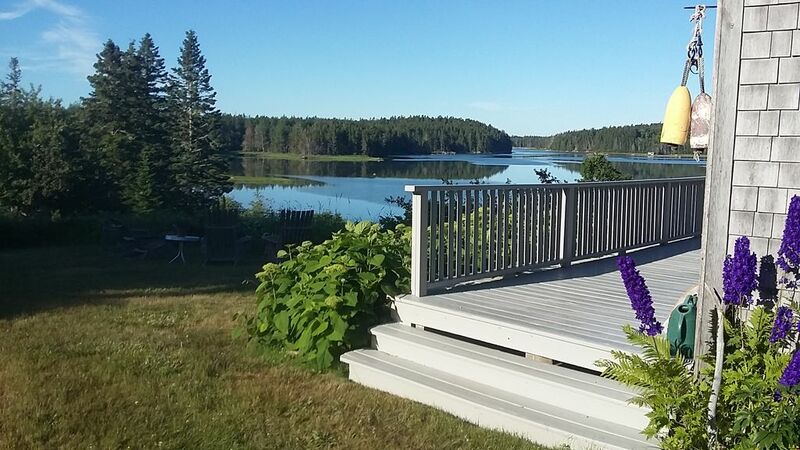 A serene and peaceful retreat for contemplation, or a special occasion ..a favorite of writers, artists, photographers, naturalists, experienced wilderness paddlers, fishermen and amateur astronomers. Kayak launch site on property affords experienced ocean kayakers a wonderful daily departure for exploring the many nearby islands of our spectacular archipelago in the safety of waters outside our busy working harbor. July to October just before and after hi tide fish striped bass right from our shore or by canoe. Delicious clams and sweet wild mussels right from our shore. Eagles, Osprey, Kingfishers every day and an occasional seal or otter. Double Bed in Master B/r..Single in Guest B/R both dressed with down alternative on top of good mattresses, with very fine bed linens. Modern and well equipped kitchen, nice dinner and table ware. Attractive bath w/ glass shower. Ice Cream Maker, French Press Coffee Maker, Espresso Machine,Nicely equipped kitchen. Truly a cut above most other island vacation rentals. July ( from Jun 30)and August 7 nt minimum sat to sat. 4nt minimum otherwise. Life long builder of public policy now head of Bowker Associates Science & Research In The Public Interest, a globally respected voice in sustainable mining, environmental security, social and economic justice.. When I first laid eyes on Cove Meadow I knew I would never see or have an opportunity to be the caretaker of such a magnificent and unique property. 10 acres f meadow, ringed with tall ancient woods, 1800 feet f shore cove frontage, estuary frotage and brook frontage. I have restored to pristine conservation standards and done the main house and its two guest houses and gardens to honor Maine and island traditions of simplicity. Gas Fireplace, Gas Grill, Firepit on lawn, Canoe & two small kayaks available for experienced paddlers Satellite TV, Tape Player with small library of Cd's and tapes, Linens Provided, nice appliances, well equipped kitchen with stainless pots and pans and elegant complete table service. wild harvest of endless wonder from our big meadow and long shore Kayak or small power boat launch from our shore.Hi Speed Wireless. Firepit on the lawn and large firepits/lobster bake pit on beach. What a great time in coastal Maine. A cottage in a perfect setting, with all the amenities that make a great place even better. Close to hikes, shore activities (canoeing! ), good food, wildlife views (porpoises! ), scenic vistas you can't see any where else. Lovely host who is friendly, engaging & knowledgeable of the area. Autumn is beautiful here. Highly recommend the cottage to anyone wanting to "get away from it all". We enjoyed very much the quaint cottage with the gorgeous view of the cove. Thanks to Lindsay’s, the owner, attentive skills and knowledge of the area, our trip was such a success! Dear Brady's..The pleasure was all mine. You are delightful people and it was my good fortune you chose my cottage. Thanks or this lovely review. Much appreciated!!! Ken & I had a most enjoyable relaxing time staying at Cove Meadow for a week. Lindsay was a terrific hostess and shared her love of the Meadow with us. The town of Stonington is very small but a delightful fishing village that has several wonderful restaurants, not to mention the lobsters & lobster rolls & mussels. The cottage was equipped with everything one would need. A very cozy home with a beautiful view. At the foot of the Deer Isle Bridge was a new lobster shack that had just opened. It has a lovely picnic area over looking the water. The LDI Lobster shack served whole 1 1/4 lobster dinners with all the trimmings. Delicious! We highly recommend Cove Meadow. Thnk you for this lovely eview. Much appreciated. I loved having you. You are both so gracious and full of life and grace. The best neighbors & guests imaginable. This cabin was just as described, very comfortable, beautiful location, all the necessities, and a warm and attentive host. We are an older couple and found this to be a perfect spot to get away from the hustle and bustle. Cam & Mona..the pleasure was all mine. You are delightful people and of course perfect guests. I hope to see you again and meanwhile wish you both all the best!!! Enjoyed a very quiet and restful stay. The unit was cozy, and comfortable. Amazing to be able to have use of two kayaks and a canoe. Thank you for a wonderful place to call home for a few days. the work of local artists and artisans year round.